The global healthcare contract research outsourcing market is rising with increasing complex regulatory process & growing regulatory burden. The global healthcare contract research outsourcing market was valued over US$ 30 Bn in 2016 and is projected to witness cumulative annual growth rate (CAGR) of over 6% from 2017 to 2025 to surpass the value of US$ 54 Bn by 2025. The global market is witnessing relatively higher growth owing to globalization of clnical trials, increasing efforts for optimization of costs and development time for drug development and rise in varied services and solutions offered by the CROs. Healthcare companies often outsource drug development functions to contract research organizations to efficiently and effectively use the development capabilities internationally. The clinical, therapeutic and regulatory expertise of CROs helps to improve the complete cost of development and accelerate time to market for a new product. CROs have become larger and enormously more diversified across various therapeutic areas and functions, expanding their penetration. CROs are anticipated to expand geographically and add competencies in emerging therapeutic areas, while boosting their current services beyond traditional clinical capabilities, including post-approval, commercial, informatics, among other auxillary offerings where low outsourced penetration observed, further enhancing the demand for CROs, driving greater outsourcing demand. The healthcare contract research outsourcing market is projected to witness strong growth during the forecast period driven by increase in funding of small to midsized pharmaceutical, biotechnology, and medical devices companies leading the companies to opt for CRO services with focus on niche market. Small pharmaceutical companies are also looking for advancement in product development through CRO services due to rise in demand for innovative products and patent expiration. Also outsourcing improves the global reach with respect to drug development with minimum maintenance cost, as CROs are well-versed with regulatory requirements of various regions to fuelling the expansion of healthcare contract research outsourcing market. The global healthcare contract research outsourcing market is broadly segmented into four categories based on service, therapeutic area and end user and by region. In terms of services, the global market is categorized into on clinical trial services, regulatory services, clinical data management & biometrics (electronica data management, electronic patient report outcomes and others), medical writing, pharmacovigilance, site management protocol and others. The clinical trial services is further segmented into preclinical & clinical. The clinical data management & biometrics is further segmented into electronica data management, electronic patient report outcomes and others. The market for clinical trial services accounted for key share (in terms of revenue) in global market in 2016, the regulatory services in healthcare contract research outsourcing is estimated to grow at exponential growth rate during the forecast period and the segment is estimated to report significant gain in its market share by the end of 2025. The regulatory services outsourcing is anticipated to increase due to increased scrutiny by regulatory bodies such as the FDA and EMA at every stage of clinical trial and changing regulatory requirements as per the region. In terms of therapeutic area, the global healthcare contract research outsourcing is segmented into oncology/hematology, CNS, CV/metabolic, respiratory, infectious diseases, immunology, rare diseases, medical devices and others. The oncology/hematology segment dominated the global market and is likely to maintain its dominance by the end of 2025 with marginal decline in its market share. A robust pipeline of more than 600 molecules for oncology in late-stage development and the emergence of oncology therapy as a personalized medicine has led to prominent share of the segment in global market. By end-user, the global healthcare contract research outsourcing market has been segmented into pharmaceutical companies, biotechnology companies, medical devices and academic institutes & government organizations. Geographically, the global dental practice management market is segmented into North America, Europe, Asia Pacific, Latin America and Middle East & Africa. North America dominated the global market and is projected to slightly lose its market share by the end of 2025. The Market in the North America is primarily driven by the advanced infrastructure of clinical research sites, and effective government incentive programs in United States. Moreover increased access to specialized technologies and therapeutics expertise is projected to fuel the expansion of clinical trial services in the United States during the forecast period. 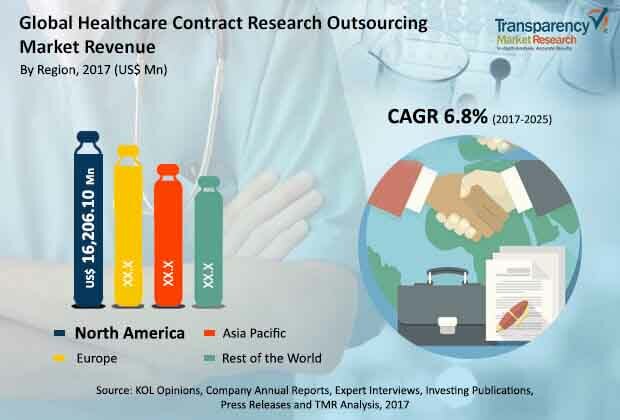 Asia Pacific region is projected to be fastest growing region in global healthcare contract research outsourcing market during the forecast period. In Asia Pacific region, China and India dominated the Healthcare CRO market and India is estimated to grow at exponential CAGR during the forecast period. The companies like Syneos Health, IQVIA, PRA Health Sciences, Inc., ICON PLC, and Laboratory Corporation of America Holdings etc. accounted for the major share in global healthcare contract research outsourcing market in 2016. The IQVIA Company has presence in more than 100 countries with domain expertise, institutional knowledge across scientific methods, diseases and geographies. Other global players operating in the market PAREXEL International, Charles River, Medpace and Pharmaceutical Product Development, LLC are adopting the strategy acquisition and collaboration with parallel companies to expand its service and strengthen its geographic presence in international market.